The man who claims to have no need of philosophy is the one most apt to be fooled by it. 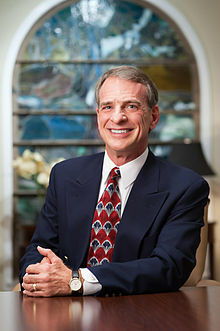 William Lane Craig (born August 23, 1949) is a Christian apologist, evangelist, and author and editor of over 30 books. In order to receive forgiveness, we need to place our trust in Christ as our Savior and the Lord of our lives. But if we reject Christ, then we reject God's mercy and fall back on His justice. And you know where you stand there. If we reject Jesus’ offer of forgiveness, then there is simply is no one else to pay the penalty for your sin – except yourself. I truly wish with all my heart that universal salvation were true. But to pretend that people are not sinful and in need of salvation would be as cruel and deceptive as pretending that somebody was healthy even though you knew that he had a fatal disease for which you knew the cure. Heaven may not be a possible world when you take it in isolation by itself. It may be that the only way in which God could actualize a heaven of free creatures all worshiping Him and not falling into sin would be by having, so to speak, this run-up to it, this advance life during which there is a veil of decision-making in which some people choose for God and some people against God. Otherwise you don't know that heaven is an actualizable world. You have no way of knowing that possibility. The Craig-Bradley Debate: Can a Loving God Send People to Hell? (1994)., quoted in Muehlhauser, Luke (2011-04-27). "William Lane Craig vs. Ray Bradley (debate review)". Common Sense Atheism. Retrieved on 2011-10-21. Okay, look at it this way: if the evening news has a very high probability of being accurate, then it's highly improbable that they would inaccurately report the numbers chosen in the lottery. That counterbalances any improbability in the choosing of those numbers, so you're quite rational to believe in this highly improbable event. Strobel, Lee (2000). The Case for Faith: A Journalist Investigates the Toughest Objections to Christianity. Grand Rapids: Zondervan. ISBN 9780310565703. In general, Western culture is deeply post-Christian. It is the product of the Enlightenment, which introduced into European culture the leaven of secularism that has by now permeated Western society. While most of the original Enlightenment thinkers were themselves theists, the majority of Western intellectuals today no longer considers theological knowledge to be possible. The person who follows the pursuit of reason unflinchingly toward its end will be atheistic or, at best, agnostic. (July 2008). "God Is Not Dead Yet". Christianity Today 52 (7). "Did Jesus Rise from the Dead?" debate with Richard Carrier, 2009. Very often atheists themselves admit that they have no evidence of God's absence, but they try to put a different spin on it. They'll tell you, “No one can prove a universal negative” (like “There is no God”). They think this somehow excuses them from needing evidence against God's existence. But not only is it false that you can't prove a universal negative (all you have to do is show something is self-contradictory), but more importantly, this claim is really an admission that it's impossible to prove atheism! Atheism involves a universal negative, you can't prove a universal negative, therefore, atheism is unprovable. It turns out that it is the atheist who is believing a view for which there is and can be no evidence. And therefore, even though animals are in pain, they aren't aware of it. They don't have this third order pain awareness. They are not aware of pain, and therefore they do not suffer as human beings do. Now, this is a tremendous comfort to those of us who are animal lovers, like myself, or to pet owners. Even though your dog or your cat may be in pain, it isn't really aware of being in pain, and therefore it doesn't suffer as you would when you are in pain. Moreover, if we believe, as I do, that God's grace is extended to those who die in infancy or as small children, the death of these children was actually their salvation. We are so wedded to an earthly, naturalistic perspective that we forget that those who die are happy to quit this earth for heaven's incomparable joy. Therefore, God does these children no wrong in taking their lives. So whom does God wrong in commanding the destruction of the Canaanites? Not the Canaanite adults, for they were corrupt and deserving of judgment. Not the children, for they inherit eternal life. So who is wronged? Ironically, I think the most difficult part of this whole debate is the apparent wrong done to the Israeli soldiers themselves. Can you imagine what it would be like to have to break into some house and kill a terrified woman and her children? The brutalising effect on these Israeli soldiers is disturbing. Subject: Slaughter of the Canaanites. Reasonable Faith. Retrieved on 2011-10-20., quoted in Dawkins, Richard (2011-10-20). "Why I refuse to debate with William Lane Craig". Guardian. Retrieved on 2011-10-20. Subject: The “Slaughter” of the Canaanites Re-visited. Reasonable Faith. Retrieved on 2011-10-20., quoted in Dawkins, Richard (2011-10-20). "Why I refuse to debate with William Lane Craig". Guardian. Retrieved on 2011-10-20.
viewable at ReasonableFaithOrg (2012-10-09). Eastwooding Richard Dawkins. YouTube. Retrieved on 2012-10-10. Also quoted in Gryboski, Michael (2012-10-09). "Christian Apologist ‘Eastwooding’ After Richard Dawkins Refuses Debate". The Christian Post. Retrieved on 2012-10-10. What good does it do to pray about anything if the outcome is not affected? I would say when God chooses which world to actualize, he takes into account the prayers that would be offered in that world. We shouldn't think prayer is about changing the mind of God. He's omniscient; he already knows the future, but prayer makes a difference in that it can affect what world God has chosen to create. Posed question: "What’s the value in praying for God's will to be done for the outcome of a game if God's will will be done whether we pray or not?" The atheist believes the (Schlitz) beer commercial, which tells us to “Go for the gusto since we only go around once!” Now, I submit that’s a patently false view of ethics. If there is no God then Mr. Zindler is absolutely right—just live for total self-interest. There is no objective right and wrong. Nobody holds you accountable so just go for all the gusto you can get. Now, of course, you have to be rather careful about this because if you just pursue your unbridled lusts you may hurt other people and they, in turn, may try to get you back and diminish your gusto. Dr. Lewis Wolpert: But because there is a beginning doesn't imply a god. Craig: It does if the first premise (of the Kalam Cosmological Argument) is true; that whatever begins to exist has a cause. It logically follows. Wolpert: Yeah, but the cause doesn’t have to be God. Craig: Well, remember I gave an argument for thinking that this cause is timeless, spaceless, immaterial, enormously powerful, and personal. Wolpert: I think it is a computer. Craig: Well, computers are designed by people. Wolpert: No, no. This is a self-designing computer. Craig: Well that's a contradiction in terms. Wolpert: Why? What is contradictory about it? Craig: A computer has to function. It takes time. Wolpert: Oh no, this is a special computer. Craig: Yeah, but it has to be logically coherent. Wolpert: Oh, it is logically coherent. Craig: Yes, you have to be logically coherent. Wolpert: Oh, no, this computer is amazing! Craig: A computer is a physical object. Wolpert: Not this computer, oh no! Craig: OK, see what you are doing is you are actually, what you are calling a computer is really God. A non-physical . . . non- it is just another word if you rob it of all the attributes that make it a computer. Humphrys: Surely, Gates is God. [Craig, Wolpert, Humphrys and the audience laugh] Come on, go on. Hitchens: I've got another question for you, which is this: How many religions in the world do you believe to be false? Craig: I don't know how many religions in the world there are, so I can’t answer. Hitchens: Well, could you name . . . fair enough. I'll see if I can't narrow that down. That was a clumsily asked question, I admit. Do you regard any of the world's religions to be false? Craig: Yes, I think—yes, certainly. Craig: I'd be happy to concede (laughs) that. I would agree with that. Hitchens: So if I was a baby being born in Saudi Arabia today, would you rather it was me or a Wahhabi Muslim? Hitchens: Would you rather it was me—it was an atheist baby or a Wahhabi baby? Hitchens: You don’t? As bad as that, O.K. Are there any—I'm sorry. I've only got a few seconds. It's a serious question. I shouldn't squander it. Are there any Christian denominations you regard as false? Craig: Well, I am not a Calvinist, for example. I think that certain tenets of Reformed Theology are incorrect. I would be more in the Wesleyan Camp myself. But these are differences among brethren. These are not differences on which we need to put one another in some sort of a cage. So within the Christian camp, there's a large diversity of perspectives. I'm sure there are views that I hold that are probably false, but I'm trying my best to get my theology straight, trying to do the best job. But I think all of us would recognize that none of us agree on every point of Christian doctrine, on every dot and tittle. My arguments for the existence of God show that metaphysical naturalism is not true. There is a personal, transcendent reality beyond the physical universe. Secondly, I think that metaphysical naturalism is so contrary to reason and experience as to be absurd. According to Dr. Rosenberg, if naturalism is true then I cannot think about anything. That is because there are no intentional states. Therefore, naturalism is not true. So, if you think that you ever think about anything you should conclude that naturalism is false. According to Dr. Rosenberg, if naturalism is true then no sentence has any meaning. And he says that all the sentences in his own book are in fact meaningless. But, premise (1) has meaning. We all understood it. According to Dr. Rosenberg, if naturalism is true then there are no true sentences. That is because they are all meaningless. But, premise (1) is true. That is what the naturalist believes and asserts. According to Dr. Rosenberg, if naturalism is true then I am not morally praiseworthy or blameworthy for any of my actions because, as I said, on his view objective moral values and duties do not exist. According to Dr. Rosenberg, if naturalism is true then I do not do anything freely. Everything is determined. According to Dr. Rosenberg, if naturalism is true then I do not plan to do anything. According to Dr. Rosenberg, if naturalism is true then I do not endure for two moments of time. According to Dr. Rosenberg, if naturalism is true then I do not exist. He says there are no selves, there are no persons, no first-person perspectives. In a word, metaphysical naturalism is absurd. Notice that my argument is not that it is unappealing. Rather, it is that metaphysical naturalism flies in the face of reason and experience and is therefore untenable. Is there no reason for life? And what of the universe? Is is utterly pointless? If its destiny is a cold grave in the recesses of outer space, then the answer must be yes. The way in which I know Christianity is true is first and foremost on the basis of the witness of the Holy Spirit in my heart. And this gives me a self-authenticating means of knowing Christianity is true wholly apart from the evidence. And therefore, even if in some historically contingent circumstances the evidence that I have available to me should turn against Christianity, I do not think that this controverts the witness of the Holy Spirit. Doubt is never simply an intellectual problem. There is always a spiritual dimension to doubt, as well. There is an enemy of your souls, Satan, who hates you intensely and is bent on your destruction and who will do everything within in his power to see that your faith is destroyed. And therefore when we have these intellectual doubts and problems we should never look at them as something that is spiritually neutral or divorce them from the spiritual conflict that we are involved in. Rather we need to take these doubts to God in prayer, to admit them honestly, to talk to our Christian friends about them, to not stuff them or hide them, we need to deal with them openly and honestly and talk to people about them and seek God's help in dealing with them. Question from an audience member: What role does the Holy Spirit play in your ministry? Relpy from William Lane Craig: Good question. I have found it very helpful to differentiate between what I call knowing Christianity to be true and showing Christianity to be true. I think that the fundamental way in which we know Christianity is true is through the inner witness of the Holy Spirit. I do not think that arguments and evidence are necessary in order for faith to be rational, or for you to know that God exists and has revealed himself in Christ. So I would say that the fundamental way we know Christianity is true is through the witness of the Holy Spirit and reason and argument then can confirm the Spirit's witness. The person who has good apologetic arguments passes, in a sense, a double warrant for his faith. He has the warrant provided by the Holy Spirit, and then he has the double warrant provided by argument and evidence. But should he lack the argument and evidence he can still be warranted just on the basis of the Holy Spirit. That's knowing Christianity to be true. When it comes to showing Christianity to be true we're dealing with somebody else, and therefore we need to give them arguments and evidence to show them that what I know to be true is true. And then the role of the Holy Spirit will be to use those arguments and evidence as I lovingly present them to draw that person to himself. So, in knowing Christianity to be true the Holy Spirit is primary and argument and evidence is secondary, but in showing Christianity to be true argument and evidence is primary and it is the Holy Spirit is secondary as using those as means by which he draws a person to himself. Audience member: Okay, just so I'm clear about what you're saying. When you say that the Holy Spirit is an epistemological answer... ...you can have complete epistemological clarity. Epistemology being the study, for those who don't know, of how you know something to be true, right? Reply from William Lane Craig: Yes, yes I think that is correct. So when I said in answer to the feloow who asked about faith earlier, that faith is trusting in what you have reason to believe is true. That reason doesn't just mean arguments and evidence. That reason could be the deliverances (?) of the Holy Spirit who I think as you say is a source of knowledge. As we progress further into the 21st century, I anticipate that natural theology will be an increasingly relevant and vital preparation for people to receive the gospel. Reasonable Faith: Christian Truth and Apologetics (Revised ed.). Wheaton, IL: Crossway. 1994. ISBN 0-89107-764-2. We've already said that it's the Holy Spirit who gives us the ultimate assurance of Christianity's truth. Therefore, the only role left for argument and evidence to play is a subsidiary role. I think Martin Luther correctly distinguished between what he called the magisterial and ministerial uses of reason. The magisterial use of reason occurs when reason stands over and above the gospel like a magistrate and judges it on the basis of argument and evidence. The ministerial use of reason occurs when reason submits to and serves the gospel... Should a conflict arise between the witness of the Holy Spirit to the fundamental truth of the Christian faith and beliefs based on argument and evidence, then it is the former which must take precedence over the latter, not vice versa. More often than not, it is what you are rather than what you say that will bring an unbeliever to Christ. This, then, is the ultimate apologetic. For the ultimate apologetic is: your life. [William Lane Craig] said that as long as God gives the thumbs-up, it's okay to kill pretty much anybody. It's okay to kill bad people, because they're bad and they deserve it... and it's okay to kill good people, because they wind up in Heaven. As long as God gives the thumbs-up, it's okay to systematically wipe out entire races. As long as God gives the thumbs-up, it's okay to slaughter babies and children. Craig said — not essentially, not as a paraphrase, but literally, in quotable words — "the death of these children was actually their salvation." Greta Christina, "One More Reason Religion Is So Messed Up: Respected Theologian Defends Genocide and Infanticide". Alternet. 2011-04-25.
quoting "Subject: Slaughter of the Canaanites", Reasonable Faith (see above). I have no intention of assisting Craig in his relentless drive for self-promotion. Richard Dawkins, quoted in Tim Ross (2011-05-14). "Richard Dawkins accused of cowardice for refusing to debate existence of God". The Telegraph. Richard Dawkins, "Why I refuse to debate with William Lane Craig", The Guardian, 20 October 2011. I just want to say, it's an honor to be here at Notre Dame, and I'm very happy to be debating Dr. Craig, the one Christian apologist who seems to have put the fear of God into many of my fellow atheists. I've actually gotten more than a few e-mails this week that more or less read, "Brother, please don't blow this." Sam Harris, "Is Good From God?" debate, University of Notre Dame, April 2011, quoted in Justin Brierley (2011-11). "Profile: William Lane Craig". Christian Magazine. But I can tell you that my, um, my brothers and sisters and co-thinkers in the unbelieving community take him very seriously. He's thought of as a, uh, tough guy; very rigorous, very scholarly, very formidable. And I say that without reserve. I don't say it because I'm here. Normally I don't get people saying "good luck tonight" and "don't let us down" but with him I do. Christopher Hitchens, pre-debate press conference, "Does God Exist? ", Biola University, 2009-04-04, clip at Christianjr4 (2009-05-05). Craig vs Hitchens Pre-Debate Press Conference. YouTube.